Parkinson's disease (PD) is a progressive neurodegenerative disorder characterized by the loss of neuronal dopamine production in the brain, causing motor and non-motor symptoms. Deep brain stimulation (DBS) was first used in the 1970s for the treatment of chronic pain. Mixed results and poor electrode design caused a cessation of significant activity in this field in the 1980s, but over the ensuing 25 years, DBS has become a safe and effective treatment for advanced movement disorders, including PD when symptoms are no longer managed adequately with medications. [1, 2] DBS is currently approved by the US Food and Drug Administration for PD and essential tremor, as well as a humanitarian device exception for dystonia and obsessive-compulsive disorder. DBS is used for patients with PD of at least 4 years' duration and 4 months of motor complications, and can improve tremor, rigidity, slowness of movement, and drug-induced dyskinesias. DBS, a form of stereotactic surgery, has become the surgical procedure of choice for Parkinson disease (PD) because it does not involve destruction of brain tissue; it is reversible and can be adjusted as the disease progresses or adverse events occur. Bilateral DBS can be performed without a significant increase in adverse events. Continued refinement of the knowledge of basal ganglia circuitry and PD pathophysiology of movement disorders has narrowed DBS surgery to 3 key gray matter structures: subthalamic nucleus (STN), pars interna of the globus pallidus (GPi), and intermediate thalamus (VIM) in the thalamus. The STN and GPi are the preferred two targets for using DBS to treat PD, but VIM can also be utilized when tremor is the primary symptom. [3, 4, 5] There are evidences in the literature demonstrating the benefit of DBS for treatment of PD. Studies have showed that DBS plus best medical therapy is superior to best medical therapy alone for advanced PD in controlling motor symptoms and improving quality of life. [6, 7, 8, 9] Moreover, a meta-analysis of randomized controlled trials of DBS in 1184 patients with PD showed that DBS significantly improves patients' symptoms, functionality, and quality of life, in addition to the reduction of the required medication dose and its associated complications. It has also been reported that the DBS benefits can be maintained for more than 10 years. The long-term outcomes of DBS of GPi and STN for patients with PD were reported in a multicenter randomized controlled trial. The results showed motor function improved between baseline and 36 months for GPi (41.1 to 27.1) and STN (42.5 to 29.7). Health-related quality of life improved at 6 months on all subscales, but improvement diminished over time. It is concluded that the beneficial effect of DBS on motor function was stable and comparable by target over 36 months. Currently, the underlying mechanism of action of DBS for treatment of movement disorders is not clear, although different theories have been proposed. DBS is a minimally invasive surgical procedure. 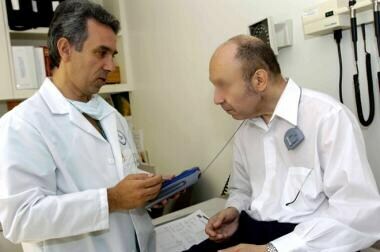 Importanly, it is effective for treatment of patients with PD. The main advantages of DBS are its reversibility and adjustability. DBS leads are placed in the target(s) and allow stimulation parameters to be adjusted in response to changes in the patient’s condition. If DBS induces unwanted adverse effects, the stimulator can be turned off, adjusted, or removed. If DBS proves clinically ineffective, the patient has not suffered an irreversible lesion to the brain. Additional advantages include the ability to intervene at targets that cannot or should not be treated with neuroablative lesion surgery and the provision of a unique opportunity to study human basal ganglia physiology. The main disadvantage of DBS is the cost. Currently, the cost of the device is approximately $10,000 per unit. Additional disadvantages include an increased risk of infection due to the presence of implanted hardware and the cost of maintenance (eg, repair or replacement of fractured wires or repeated office visits for stimulation adjustments). Currently, battery exhaustion necessitates replacement of the entire pulse generator, the most expensive component of the system (costing about $8000), every few years. The deep brain stimulation (DBS) system consists of a lead that is implanted into the targeted brain structure, such as STN, GPi, and VIM. The lead is connected to an implantable pulse generator (IPG), which is the power source of the system that is generally implanted in the subclavicular region of the upper chest. The lead and the IPG are connected by an extension wire that is tunneled down the neck under the skin (see the image below). 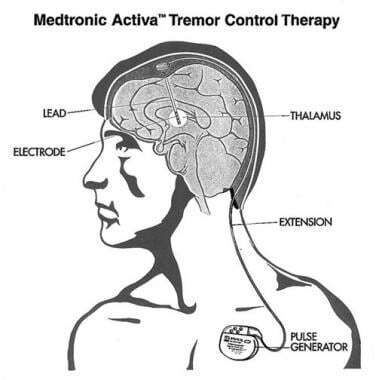 The Medtronics, Inc, Activa Tremor control system consists of 3 components: (1) the stimulating lead, which is implanted to the desired target; (2) the extension cable, which is tunneled under the scalp and soft tissues of the neck to the anterior chest wall; and (3) the pulse generator, which is the programmable source of the electrical impulses. 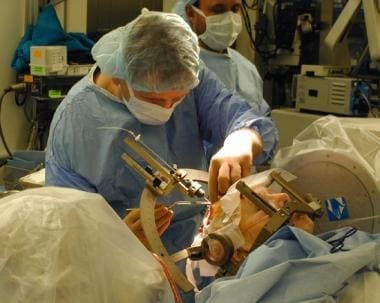 Implantation of the deep brain stimulation (DBS) lead. In DBS for Parkinson disease (PD), as in most stereotactic movement disorder procedures, the first stage is performed with the patient awake to allow monitoring of neurologic status. The stereotactic headframe (see the first image below) is applied to the patient's head on the morning of the procedure, and a targeting MRI is performed (see the second image below). The stereotactic headframe is applied at the start of surgery. The MRI-localizing box is attached to the frame only during the targeting MRI. The localizer defines the working volume of the frame and provides the reference coordinate system from which the target coordinates are derived. Axial, fast spin-echo inversion recovery MRI at the level of the posterior commissure. 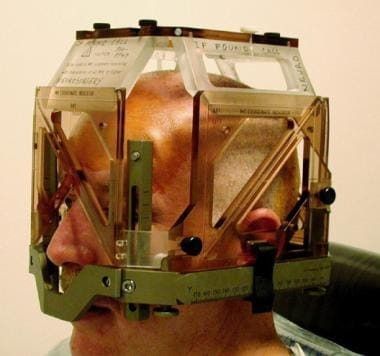 The typical target for placing a thalamic stimulator is demonstrated (cross-hairs). A combination of microelectrode recording (MER) and macroelectrode stimulation is used to refine the desired target physiologically (see the images below). Once the DBS lead has been implanted, it is anchored to the skull with a burr hole cap. 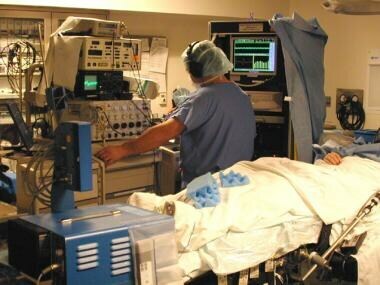 Intraoperative physiological monitoring equipment. 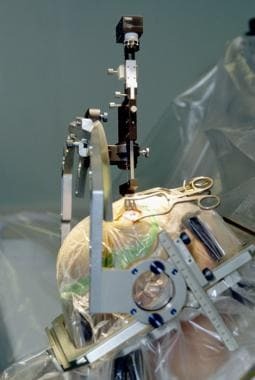 The surgical team, consisting of a neurosurgeon, a neurologist, and a highly trained neurophysiologist (pictured), employs single-cell microelectrode recording to define the surgical target physiologically. After DBS electrode implantation, CT is performed to confirm no bleeding in the brain and MRI to confirm proper electrode placement. One or two weeks later, the patient will undergo the second stage of surgery – implantation of IPG under general anesthesia. 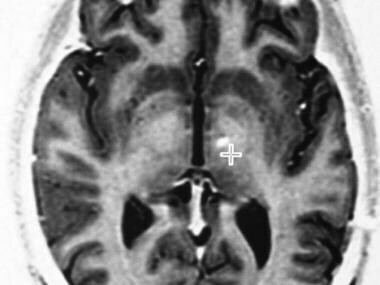 Postoperative coronal MRI demonstrating desired placement of bilateral subthalamic nuclei-deep brain stimulation (STN-DBS) leads. The electrode is thin (approximately 1.3 mm in diameter) and flexible, so that it moves atraumatically with the brain. The device can be programmed to deliver stimulation in monopolar or bipolar fashion, employing any of the 4 electrode contacts, alone or in combination (see the image below). The deep brain stimulating lead is equipped with 4 electrode contacts, each of which may be used, alone or in combination, for therapeutic stimulation. After proper patient selection and accurate lead location, competent programming of the implanted device is essential for optimizing DBS therapy. After approximately 2 weeks, therapeutic electrical parameters can be set by using a transcutaneous programmer (see the image below). Deep brain stimulation parameters can be adjusted at any time using a transcutaneous programmer. The primary goals of programming are to maximize symptom suppression and minimize adverse effects; minimizing battery drain is a secondary goal. These goals can be achieved by following a systematic, multistep approach. The ability to deliver either monopolar or bipolar stimulation using any of the 4 electrode contacts (or combinations thereof) offers the treating physician a great deal of therapeutic flexibility, permitting customized stimulation for each patient. Moreover, stimulation parameters can be adjusted at any time if needed. DBS provides monopolar or bipolar electrical stimulation to the targeted brain area. The amplitude, frequency, and pulse width of stimulation can be adjusted to control symptoms and minimize the adverse events. The patient can turn the stimulator on or off using an Access Review Therapy Controller or a handheld magnet. The usual stimulation parameters are an amplitude of 1–3 V, a frequency of 135–185 Hz, and a pulse width of 60–120 msec. It has been suggested that DBS works by resetting abnormal firing patterns in the brain and thereby bringing about a reduction in parkinsonian symptoms. The response from DBS is only as good as the patient’s best “on” time, with the exception of tremor, which may show greater improvement than is seen with medication; however, after DBS, the amount of daily “on” time is significantly extended. DBS requires regular follow-up for adjustment of stimulation parameters to account for symptom changes due to disease progression and adverse effects. Traditional DBS surgery is performed while patients stay awake. With improvement in high-resolution brain imaging, interventional MRI-guided DBS lead implantation (asleep DBS) has been developed, in which anatomic verification of target can be performed intraoperatively. Moreover, study has shown that microelectrode recording (MER) and intraoperative MRI are both effective to ensure adequate electrode placement in DBS surgery. Other advances include the mini-frame, robot (Rosa)-assisted stereotactic systems for DBS surgery, and rechargeable pulse generators. Currently, directional DBS with new electrode designs that have the capability to steer stimulation current for better and specific targeting, and closed loop DBS systems are under development. Like thalamotomy, thalamic deep brain stimulation (DBS) often does not provide significant functional improvement for patients with PD, because their rest tremor is not usually a source of functional disability. In fact, nowadays, thalamic DBS is rarely—if ever—offered to patients with PD. Thalamic DBS initially was used contralateral to previous thalamotomies to reduce the risk associated with bilateral thalamotomy. However, the results were so encouraging that thalamic DBS has become not only an accepted alternative to thalamotomy, but it is currently the procedure of choice for patients who require unilateral or bilateral procedures for medically refractory tremor. A decade of experience in Europe and the United States indicates that thalamic DBS is equivalent to thalamotomy for tremor suppression. Because the lesion is eliminated, hemorrhage rates and cognitive adverse effects may prove less frequent than with thalamotomy. Side effects related to stimulation, including paresthesia, dysarthria, and gait disorders, are relatively common though reversible by setting adjustments. Device-related complications, including end of battery life, skin erosion, or infection can be observed and resolved in most cases. The promising results initially achieved in the thalamus prompted the application of DBS to other key targets for the treatment of PD. Thalamic stimulation involves implantation of a DBS lead in the ventral intermediate (VIM) nucleus of the thalamus. It provides significant control of Parkinson disease tremor but does not affect the other symptoms of Parkinson disease such as rigidity, bradykinesia, dyskinesia, or motor fluctuations. Studies of thalamic DBS have demonstrated good initial and long-term tremor control up to 7 years after implantation; however, long-term studies have shown a significant worsening in other parkinsonian symptoms such as bradykinesia and rigidity and worsening of gait leading to major disability. Candidates for thalamic DBS are patients with disabling medication-resistant tremor who have minimal rigidity or bradykinesia. They should not have significant cognitive impairment, mood or behavioral disturbances, or other factors that may increase the risk of surgery. A 2005 comparative study by Anderson et al showed no significant differences in the overall benefits of DBS at these 2 sites. Long-term studies up to 4 years after pallidal DBS have continued to show significant improvements in the cardinal features of PD and dyskinesia as compared with status for surgery. Through the implantation of a DBS lead in the GPi, pallidal stimulation significantly controls all the cardinal symptoms of PD (tremor, rigidity, bradykinesia), as well as dyskinesia. Candidates for pallidal DBS include levodopa-responsive patients with medication-resistant disabling motor fluctuations or levodopa-induced dyskinesia without significant cognitive impairment, behavioral issues, or mood problems. Dyskinesia has been shown to improve dramatically, and GPi-DBS has also been effective in improving motor fluctuations. The effect on tremor is less dramatic, and significant medication reduction is usually not achieved with GPi-DBS. On the other hand, cognitive and behavioral adverse effects seem to be less frequent. Stimulator programming is more challenging in the globus pallidus than in the thalamus. Higher stimulation voltages may exacerbate freezing, nullifying the therapeutic effects of levodopa. Moreover, stimulation in different regions of the globus pallidus may have strikingly different effects. Dorsal GPi stimulation has been reported to improve akinesia and rigidity but may result in abnormal involuntary movements (ie, dyskinesias). In contrast, ventral GPi stimulation can exacerbate akinesia and gait abnormalities but improves rigidity and LID. Subthalamic stimulation involves implantation of a deep brain stimulation (DBS) lead into the subthalamic nucleus (STN). Currently, it is the surgical procedure most commonly used to treat Parkinson disease (PD). STN-DBS controls all of the cardinal symptoms of PD, as well as motor fluctuations and dyskinesia. STN-DBS also often results in significant reductions in antiparkinsonian medications. On average, dyskinesia and antiparkinsonian medication use are reduced by 50-80%. Multiple studies have examined the effects of STN-DBS and documented significant improvements in the motor symptoms of tremor, rigidity, and bradykinesia, as well as activities of daily living. Long-term follow-up reports have shown that significant improvements in motor function and activities of daily living are maintained for up to 5 years after surgery. A meta-analysis found that on average, doses of levodopa equivalents were reduced by 55.9% after STN-DBS; dyskinesia was reduced by 69.1%; daily “off” periods were reduced by 68.2%; and quality of life was improved by 34.5%. “On” time is also significantly increased, from 27% of the day at baseline to 74% at 3 months. Improvement is usually stable, at least up to 5 years. Selected patients with PD derive significant benefit from neuroablation or stimulation at the ventral intermediate (VIM) nucleus or the globus pallidus pars interna (GPi), in most instances akinesia (ie, freezing) and gait abnormalities are not improved significantly. Unfortunately, these symptoms are commonly the most disabling features of advancing PD. Consequently, a great deal of attention has been paid to a new procedure—bilateral electrostimulation of the STN. The substantial decrease in dosage and frequency of antiparkinsonian drugs that is possible after STN-DBS can have an additive effect to LID. In some cases, patients may experience severe dyskinesias necessitating the reduction of dopaminertic medications. Whereas some groups significantly decrease drug dosages immediately after surgery, the authors prefer to act more conservatively; many patients do not tolerate immediate dosage reductions and may experience significant mood abnormalities—in particular, apathy and depression. Adverse events associated with STN-DBS can be classified into 3 main groups, including surgical, hardware, and stimulation-related (see Complications), which are better recognized and managed currently. Surgical complications of deep brain stimulation (DBS) are comparable to those of other neurosurgical procedures. Serious adverse events occur in 1-2% of patients. Brain hemorrhages can result in permanent neurologic sequelae (eg, aphasia, hemiparesis, and coma) or death. Intracranial hemorrhage occurs in 3.9% of patients. Infection occurs in about 3-5% of patients and may require explantation of the device until the infection is resolved. Seizures are rarely described; postoperative confusion is relatively frequent but usually transient. The risk of surgical complicatoins may be similar between STN DBS and GPi DBS. However, GPi DBS may have a high risk of infection due to more frequent battery replacement. Although not considered a complication per se, replacement of the device’s battery generally is required every 3-5 years, and this process necessitates additional outpatient surgery. Stimulation-related complications include muscle pulling, paresthesias, eyelid apraxia, hypophonia, worsened postural instability, visual disturbances, mood changes, and pain. Hemiballismus can occur with higher stimulation voltages, but it is controlled successfully by reducing the voltage, decreasing the dose of levodopa, or both. In general, all stimulation-related complications can be addressed with electrical parameter changes. Sharma A, Szeto K, Desilets AR. Efficacy and Safety of Deep Brain Stimulation as an Adjunct to Pharmacotherapy for the Treatment of Parkinson Disease (February). Ann Pharmacother. 2012 Jan 10. [Medline]. Tierney TS, Sankar T, Lozano AM. 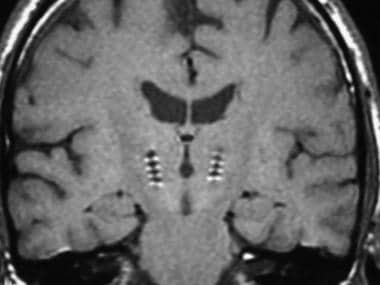 Deep brain stimulation emerging indications. Prog Brain Res. 2011. 194:83-95. [Medline]. Fang JY, Tolleson C. The role of deep brain stimulation in Parkinson's disease: an overview and update on new developments. Neuropsychiatr Dis Treat. 2017. 13:723-732. [Medline]. Follett KA, Weaver FM, Stern M, Hur K, Harris CL, et al. Pallidal versus subthalamic deep-brain stimulation for Parkinson's disease. N Engl J Med. 2010 Jun 3. 362 (22):2077-91. [Medline]. Hariz MI, Krack P, Alesch F, Augustinsson LE, Bosch A, Ekberg R, et al. Multicentre European study of thalamic stimulation for parkinsonian tremor: a 6 year follow-up. J Neurol Neurosurg Psychiatry. 2008 Jun. 79 (6):694-9. [Medline]. Williams A, Gill S, Varma T, Jenkinson C, Quinn N, Mitchell R, et al. Deep brain stimulation plus best medical therapy versus best medical therapy alone for advanced Parkinson's disease (PD SURG trial): a randomised, open-label trial. Lancet Neurol. 2010 Jun. 9 (6):581-91. [Medline]. Weaver FM, Follett K, Stern M, Hur K, Harris C, Marks WJ Jr, et al. Bilateral deep brain stimulation vs best medical therapy for patients with advanced Parkinson disease: a randomized controlled trial. JAMA. 2009 Jan 7. 301 (1):63-73. [Medline]. Deuschl G, Schade-Brittinger C, Krack P, Volkmann J, Schäfer H, et al. A randomized trial of deep-brain stimulation for Parkinson's disease. N Engl J Med. 2006 Aug 31. 355 (9):896-908. [Medline]. Perestelo-Pérez L, Rivero-Santana A, Pérez-Ramos J, Serrano-Pérez P, Panetta J, Hilarion P. Deep brain stimulation in Parkinson's disease: meta-analysis of randomized controlled trials. J Neurol. 2014 Nov. 261 (11):2051-60. [Medline]. Rizzone MG, Fasano A, Daniele A, Zibetti M, Merola A, Rizzi L, et al. Long-term outcome of subthalamic nucleus DBS in Parkinson's disease: from the advanced phase towards the late stage of the disease?. Parkinsonism Relat Disord. 2014 Apr. 20 (4):376-81. [Medline]. Weaver FM, Follett KA, Stern M, Luo P, Harris CL, et al. Randomized trial of deep brain stimulation for Parkinson disease: thirty-six-month outcomes. Neurology. 2012 Jul 3. 79 (1):55-65. [Medline]. Constantinescu R, Romer M, McDermott MP, Kamp C, Kieburtz K. Impact of pramipexole on the onset of levodopa-related dyskinesias. Mov Disord. 2007 Jul 15. 22(9):1317-9. [Medline]. Herrington TM, Cheng JJ, Eskandar EN. Mechanisms of deep brain stimulation. J Neurophysiol. 2016 Jan 1. 115 (1):19-38. [Medline]. Udupa K, Chen R. The mechanisms of action of deep brain stimulation and ideas for the future development. Prog Neurobiol. 2015 Oct. 133:27-49. [Medline]. Grill WM, Snyder AN, Miocinovic S. Deep brain stimulation creates an informational lesion of the stimulated nucleus. Neuroreport. 2004 May 19. 15 (7):1137-40. [Medline]. McIntyre CC, Anderson RW. Deep brain stimulation mechanisms: the control of network activity via neurochemistry modulation. J Neurochem. 2016 Oct. 139 Suppl 1:338-345. [Medline]. Lee PS, Richardson RM. Interventional MRI-Guided Deep Brain Stimulation Lead Implantation. Neurosurg Clin N Am. 2017 Oct. 28 (4):535-544. [Medline]. Liu X, Zhang J, Fu K, Gong R, Chen J, Zhang J. Microelectrode Recording-Guided Versus Intraoperative Magnetic Resonance Imaging-Guided Subthalamic Nucleus Deep Brain Stimulation Surgery for Parkinson Disease: A 1-Year Follow-Up Study. World Neurosurg. 2017 Nov. 107:900-905. [Medline]. McIntyre CC, Savasta M, Kerkerian-Le Goff L, Vitek JL. Uncovering the mechanism(s) of action of deep brain stimulation: activation, inhibition, or both. Clin Neurophysiol. 2004 Jun. 115(6):1239-48. [Medline]. Krack P, Fraix V, Mendes A, Benabid AL, Pollak P. Postoperative management of subthalamic nucleus stimulation for Parkinson's disease. Mov Disord. 2002. 17 Suppl 3:S188-97. [Medline]. Limousin P, Speelman JD, Gielen F, Janssens M. Multicentre European study of thalamic stimulation in parkinsonian and essential tremor. J Neurol Neurosurg Psychiatry. 1999 Mar. 66(3):289-96. [Medline]. [Full Text]. Sydow O, Thobois S, Alesch F, Speelman JD. Multicentre European study of thalamic stimulation in essential tremor: a six year follow up. J Neurol Neurosurg Psychiatry. 2003 Oct. 74(10):1387-91. [Medline]. [Full Text]. Siegfried J, Lippitz B. Bilateral chronic electrostimulation of ventroposterolateral pallidum: a new therapeutic approach for alleviating all parkinsonian symptoms. Neurosurgery. 1994 Dec. 35(6):1126-9; discussion 1129-30. [Medline]. Okun MS, Tagliati M, Pourfar M, Fernandez HH, Rodriguez RL, Alterman RL, et al. Management of referred deep brain stimulation failures: a retrospective analysis from 2 movement disorders centers. Arch Neurol. 2005 Aug. 62(8):1250-5. [Medline]. Anderson VC, Burchiel KJ, Hogarth P, Favre J, Hammerstad JP. Pallidal vs subthalamic nucleus deep brain stimulation in Parkinson disease. Arch Neurol. 2005 Apr. 62(4):554-60. [Medline]. Parkinson’s Disease Study Group. Deep-brain stimulation of the subthalamic nucleus or the pars interna of the globus pallidus in Parkinson's disease. N Engl J Med. 2001 Sep 27. 345(13):956-63. [Medline]. Walker HC, Watts RL, Guthrie S, Wang D, Guthrie BL. Bilateral effects of unilateral subthalamic deep brain stimulation on Parkinson's disease at 1 year. Neurosurgery. 2009 Aug. 65(2):302-9; discussion 309-10. [Medline]. Burchiel KJ, Anderson VC, Favre J, Hammerstad JP. Comparison of pallidal and subthalamic nucleus deep brain stimulation for advanced Parkinson's disease: results of a randomized, blinded pilot study. Neurosurgery. 1999 Dec. 45(6):1375-82; discussion 1382-4. [Medline]. Kleiner-Fisman G, Herzog J, Fisman DN, Tamma F, Lyons KE, Pahwa R, et al. Subthalamic nucleus deep brain stimulation: summary and meta-analysis of outcomes. Mov Disord. 2006 Jun. 21 Suppl 14:S290-304. [Medline]. Liu Y, Li W, Tan C, Liu X, Wang X, Gui Y, et al. Meta-analysis comparing deep brain stimulation of the globus pallidus and subthalamic nucleus to treat advanced Parkinson disease. J Neurosurg. 2014 Sep. 121 (3):709-18. [Medline]. Moro E, Lozano AM, Pollak P, Agid Y, Rehncrona S, et al. Long-term results of a multicenter study on subthalamic and pallidal stimulation in Parkinson's disease. Mov Disord. 2010 Apr 15. 25 (5):578-86. [Medline]. Odekerken VJ, van Laar T, Staal MJ, Mosch A, Hoffmann CF, Nijssen PC, et al. Subthalamic nucleus versus globus pallidus bilateral deep brain stimulation for advanced Parkinson's disease (NSTAPS study): a randomised controlled trial. Lancet Neurol. 2013 Jan. 12 (1):37-44. [Medline]. Stroupe KT, Weaver FM, Cao L, Ippolito D, Barton BR, Burnett-Zeigler IE, et al. Cost of deep brain stimulation for the treatment of Parkinson's disease by surgical stimulation sites. Mov Disord. 2014 Nov. 29 (13):1666-74. [Medline]. Xu H, Zheng F, Krischek B, Ding W, Xiong C, Wang X, et al. Subthalamic nucleus and globus pallidus internus stimulation for the treatment of Parkinson's disease: A systematic review. J Int Med Res. 2017 Oct. 45 (5):1602-1612. [Medline]. Williams NR, Foote KD, Okun MS. Subthalamic Nucleus Versus Globus Pallidus Internus Deep Brain Stimulation: Translating the Rematch Into Clinical Practice. Mov Disord Clin Pract. 2014. 1:24-35. Mirza S, Yazdani U, Dewey Iii R, Patel N, Dewey RB Jr, Miocinovic S, et al. Comparison of Globus Pallidus Interna and Subthalamic Nucleus in Deep Brain Stimulation for Parkinson Disease: An Institutional Experience and Review. Parkinsons Dis. 2017. 2017:3410820. [Medline]. Odekerken VJ, Boel JA, Schmand BA, de Haan RJ, Figee M, van den Munckhof P, et al. GPi vs STN deep brain stimulation for Parkinson disease: Three-year follow-up. Neurology. 2016 Feb 23. 86 (8):755-61. [Medline]. Thevathasan W, Debu B, Aziz T, Bloem BR, Blahak C, et al. Pedunculopontine nucleus deep brain stimulation in Parkinson's disease: A clinical review. Mov Disord. 2017 Sep 28. [Medline]. Jitkritsadakul O, Bhidayasiri R, Kalia SK, Hodaie M, Lozano AM, Fasano A. Systematic review of hardware-related complications of Deep Brain Stimulation: Do new indications pose an increased risk?. Brain Stimul. 2017 Sep - Oct. 10 (5):967-976. [Medline]. Rascol O, Brooks DJ, Korczyn AD, De Deyn PP, Clarke CE, Lang AE. A five-year study of the incidence of dyskinesia in patients with early Parkinson's disease who were treated with ropinirole or levodopa. 056 Study Group. N Engl J Med. 2000 May 18. 342(20):1484-91. [Medline]. Disclosure: Received honoraria from Novartis for speaking and teaching; Received honoraria from Teva Neuroscience for speaking and teaching; Received honoraria from St Jude Medical for board membership.